- Rue de Montorgueil. A lovely street lined with fromageries, boulangeries, patisseries, and so much more that I didn’t get to quite explore as we were pressed for time. This article was very helpful though! - Strolling along the Seine, which was even more beautiful than I imagined. There was also an interactive portion, with a giant chalkboard, fun games and maps painted on the cement, and pop-up restaurants/cafes that made the Seine a bustling, fun place to be on Saturday evening. - Le Marais! I only got a tiny glimpse of this neighborhood, but the falafels, cool bar/bookshop, and other little shops I sorely wish we could’ve popped into, made me determined to go back next time when in Paris. - Musee de Orsay. They had an awesome temporary Fauvist exhibit, but the Impressionist Gallery took my breath away several times. Renoir! Manet! Monet! Degas! SO much beauty!!! Even though we got to enter the Louvre for free (after 6pm on Friday nights for 26 and under), the Orsay was my hands down favorite. 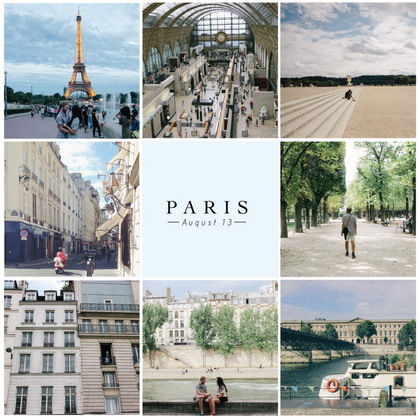 Paris, you’ve stolen my heart! ‘Til next we meet!